Hey, Dex, do you know what this cute creature is? It's a pika, right? They're named after Pikachu? 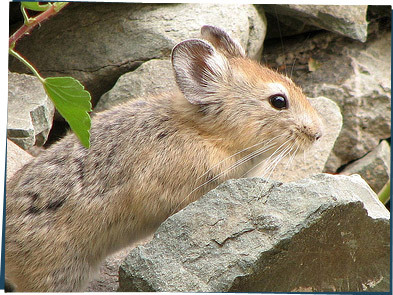 Not quite... but it is a pika. They live in cooler places like the Rocky Mountains, where they burrow into the ground and make nests. And check this out. When they dive into their nests, they scream out a warning to other pikas so they don't land on their friends! That's awesome. How can I meet one? Well, you could go to a cold mountain and look, but you better hurry. As the planet gets hotter, also known as global warming, pikas will be forced higher and higher up into the mountains to find a colder place to live. Pretty soon, these adorable animals will have a really tough time finding somewhere to burrow. In that case, I guess I better get to the Rockies soon!